As a father of three children under 8 years old Steve can only daydream about personal hobbies. He is an avid (and long-suffering) Nottingham Forest fan and hopes to introduce his brood to the delights of the City Ground as they grow old enough to appreciate disappointment. When not being run ragged by his children Steve is the Managing Director and co-owner of Littlefish. As MD Steve is responsible for organisational development and financial performance, as well as pitching in on the new business front frequently. Since acquiring Littlefish in late 2010 Steve has overseen the business’s technical and operational capability improvements, spearheading the implementation of next generation technologies like User Experience Monitoring and IT Process Automation. 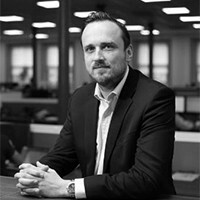 Steve has worked in the IT Industry since leaving school (nearly 20 years ago) and has held senior roles in Computerland UK Plc and Capita, where he was responsible for turning a marginally loss making multi-million pound division to a 40% operating profit margin within 24 months.